This 30,000 square-foot pre-engineered metal building structure achieved an United States Green Building Council LEED certification and was the first ever Air National Guard LEED certified facility in the United States. 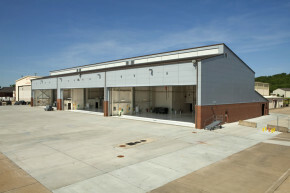 Challenged with a small/limited footprint for site construction and building within the flight line of an active air base, SSi assembled an impressive design-build team with the experience and knowledge to meet the demands. The project was completed in budget and on-time as well as successfully diverting 98% of the construction waste from the landfill.